Tool Box vs Tool Bag: Which One Is Right For You? If you are in the trades, you know that you always need to have your tools on hand to remedy any issues that come to hand. Whether you are a plumber, carpenter, electrician, handyman, general laborer, or home hobbyist, you need to have your tools with you. After all, you are not going to be installing wires, fixing plumbing, or building a table with just your bare hands. That just won’t work. However, when it comes to tool carrying and storage accessories there is quite a bit of choice around. Most people choose either the tool box or the tool bag, but which one is right for you? Today we are here doing a tool box vs tool bag comparison to try and figure out which one is right for you. Keep in mind, we probably won’t say that one is better than the other outright, but each is going to have its advantages and disadvantages that you will need to think about. We have looked at 4 main features for comparison, so how does the tool box vs tool bag debate stack up? Like we said, we are here to look at tool boxes and tool bags, as well as to do a direct comparison between the two. Of course, tool boxes and tool bags are both items used for the storage and transportation of tools. Both are things that people of many professions need in order to take their tools with them to effectively perform their jobs. There are of course some differences between tool boxes and tool bags, ones which you will want to take into consideration. Generally speaking, tool bags are good for lots of little random tools, accessories, and specific items that you need with you while working. Tool boxes are good for this too, but they do have the ability to carry heavier things, plus they are much better for organization too. This is all very general though and may not apply to a specific tool box or tool bag. That being said, we are going to do our very best to do a side by side comparison of the main considerations you need to keep in mind in this tool box vs tool bag debate. We are going to be looking at some of the most important aspects such as storage capabilities, organization, portability, locking, weight, size, and more. At the end of it all, we hope that you can come to a more concise conclusion as to which is better for you, the tool box or the tool bag. Durability might just be the number one important feature that you need to consider when buying either a tool box or tool bag. Simply put, you don’t want the thing that is carrying your tools to come apart at the seams. Not only would that be inconvenient but falling hammers on your toes can hurt quite a bit. You need a tool carrying accessory that is tough, durable, and built to last. These things can be fairly expensive, so you don’t want a product that is going to implode on you after just a few uses. Make no mistake about it, there are some fairly durable tool bags out there. These things can be made of many different materials, usually a strong synthetic is used, sometimes canvas, leather, or a mix of many other materials like cotton, nylon, polyester, and others. That being said, tool bags are made of fabric and fabric just is not as strong as metal. Also, tool bags need to be stitched or sewn together at the seams, these seams are often problem areas as they can rip apart if there is too much weight in the bag. Yes, some tool bags come with internal metal frames, but those really don’t do all that much to add to the overall integrity of the tool bag. When it comes to overall durability, the tool box is a big time player. Tool boxes are most often made of normal steel, stainless steel, aluminum, or some other tough metal. The bottom line is that metal is tough and durable. The winner here is the tool box. There is just no denying that metal is tougher than fabric and will last for a much longer time to come. Another important feature you need to consider is how safe your tools will be. This actually has 2 aspects to it, one being safety from being dropped, and other being safety from thieving fingers. Let’s compare the tool box and tool bag to see which one keeps your tools safer. Like we said, tool bags are made of fabric, much like a heavy duty backpack. Simply put, this means that if you drop the tool bag, there is nothing to really protect the tools, which goes for the tools on the inside and outside of the bag. On that same note, tool bags usually don’t have any kind of locking mechanism, which is especially true for tools kept on the outside. Tool boxes are definitely a great option for keeping your tools safe. Tool boxes have tough metal walls that will add a certain amount of protection for your tools in case you drop the box. At the same time, tool boxes usually allow you to lock them, so no one can get in without the keys. The tool box is the winner here. There is just no denying that strong metal walls with lockable drawers and lids will keep your tools much safer than a fabric bag that cannot be locked. Portability is usually a pretty big deal too. Most people who work in the trades do not just work from home, which is why everybody wants a tool carrying and storage item that is portable. You want something that is not too heavy, can be easily carried, and won’t get in your way as you move from one jobsite to another. So, which one is more portable, the tool bag or the tool box? Tool bags are definitely very portable. Their fabric build makes them fairly lightweight, which is always nice when lugging around tools. Also, tool bags are usually not all that big, making them easier to carry. Furthermore, tool bags come with carrying straps, so you can easily carry them with one hand or sling them over your shoulder. Tool boxes tend to be fairly heavy due to their metal construction, much heavier than a tool bag. 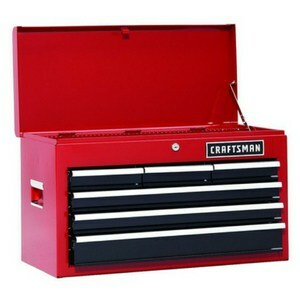 Moreover, tool boxes are square and bulky, which can make them awkward to carry around. Yes, tool boxes do usually come with some kind of handle for carrying, but they tend to also be a little awkward to deal with. The winner here is the tool bag. Tool bags are more portable and easier to carry around for a variety of reasons. The final feature we want to talk about is that of storage and organization. 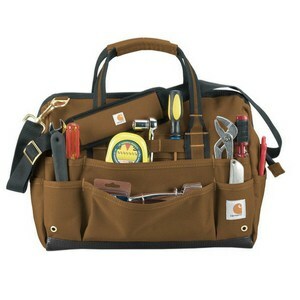 After all, the point of both the tool box and tool bag is store and transport your tools in an organized manner. So, which is better in this sense, the tool box or tool bag? The tool bag is decent in terms of storage. These things usually have a large internal pocket, many small internal pockets, and many external pockets. Yes, they can hold a fair number of tools, but they are usually better for smaller tools. Also, in terms of organization, tool bags are alright, but they are not the best. You pretty much end up shoving tools in whatever pocket they can fit in. Tool bags do tend to be fairly roomy though, which is something that many people like about them. Tool boxes are definitely top notch when it comes to tool organization. They usually come with several different layers and compartments for storing tools. Keeping your tools organized tends to be pretty easy with these things. Now, in terms of storage space, it really depends on the size of tool box you get. Some are smaller, and some are larger. We are going to call this one a draw, because while tool bags might be able to hold more items than your average tool box, in terms of organization, they are not as ideal. So, tool bags are more portable than tool boxes, but tool boxes are more durable, and they keep your tools safer. In terms of storage and organization, we are calling it a draw as we have explained above. ​There are many different options available to you for storing your tools. You can choose from a tool chest, a rolling toolbox, a cabinet, a metal or plastic toolbox, or a tool bag. They are all wonderful options, but many contractors and tradesmen are choosing to use a tool bag to lug all of their tools around. Let’s look at some advantages of a tool bag over a tool box or other options. 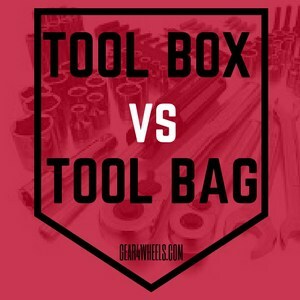 When it comes to this tool box vs tool bag debate, in our opinion, you are better off with a tool box, but that being said, you might like the portability of a tool bag more.